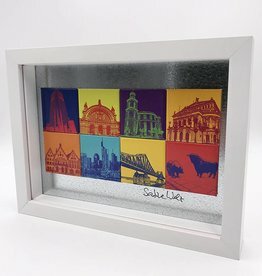 MAGNETIC IMAGES CONSISTING OF 8 MAGNETS THAT MAKE A GENERAL IMAGE. In addition to the individual ART-DOMINO® magnets, I also offer magnet sets and collages with different numbers. 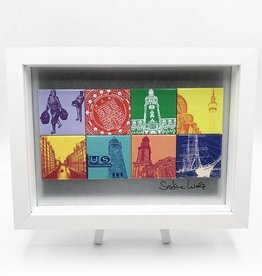 These set consists of 8 magnets that together give either a large motif or just 8 individual magnets that can be put together individually. Individually (24,-), framed (54,-) or on a metal plate (34,-) - of course with signature. From a quantity of 10 pieces per design we can also offer you personal motive and color conversions. 8-part magnetic picture with different designs from Frankfurt. 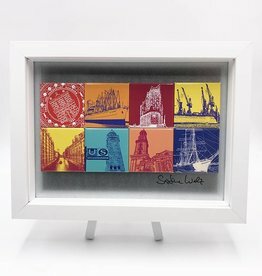 8-part magnetic picture with different designs from Hamburg.